As a leading provider of network equipment for SMBs, NETGEAR® understands the importance of reliable and high performance networks. With the growth of virtualization, cloud-based services and applications like VoIP, video streaming and IP surveillance, SMB networks need to extend beyond simple reliability to simpler management and remote monitoring to ensure your network is “always up”. 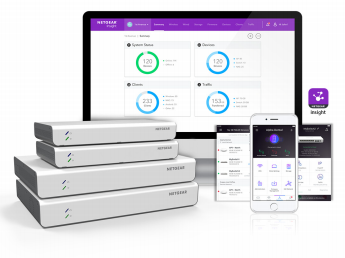 NETGEAR also understands that small business owners shouldn’t have to understand networking and IT; they need a network that’s easy-to-setup and is reliable, so they can focus on their business, not their network. To that end, NETGEAR is introducing our most versatile and easy-to-manage switches ever, NETGEAR Insight Managed Smart Cloud switches. NETGEAR Insight Managed switches are fully-integrated, cloud-manageable, plug-andplay devices. Just connect to your network and without any setup, they’re passing traffic. For configuration setup, management, and monitoring, you can use the Insight mobile app on your mobile device or the Insight Cloud Portal from your PC, Mac, or tablet web browser. No additional cloud controller, appliance, network manager, or on-premise cloud server necessary. Insight Managed switches have a modern, clean design, with simple power and cloud connection LEDs on the front. GC110, GC110P and GC510P models are all fanless and silent, while GC510PP has a whisper-quiet fan. All models have 8 copper Gigabit Ethernet ports and two 1G SFP fiber ports for uplinks. On PoE/PoE+ models, all 8 gigabit copper ports support PoE or PoE+, with varying PoE power budgets to suit every need. *This product comes with a limited warranty that is valid only if purchased from a NETGEAR authorized reseller, and modifications to product may void the warranty; covers hardware, fans, and internal power supplies—not software or external power supplies. ** The NETGEAR OnCall 24x7 contract provides unlimited phone, chat and email technical support for your networking product. 1000BASE-T Copper Ethernet PoE (GC110P)/PoE+ (GC510P/ GC510PP) connections Support high-density VoIP, Surveillance and Wi-Fi AP deployments, scalable for future growth. Never face the risk of running out of PoE ports or PoE power budget. 1000BASE-X SFP ports Two dedicated Gigabit SFP ports Dedicated SFP ports provide fiber uplinks without sacrificing any downlink copper Gigabit Ethernet port, and across long distances. Support for Fiber and Copper modules. Front Cloud & Power LEDs Quickly confirm switch has power and is connected to the cloud/internet. Silent or Low (GC510PP) Acoustics Fanless design (all except GC510PP) allows for silent operation; temperature- and load-based fan-speed control (GC510PP) provides whisper-quiet operation; great for deployment in noise-sensitive environments. Desktop, Wallmount, or Rackmount (GC510P, GC510PP) Flexible deployment on desktop, wall or other location using 75mm VESA-compliant mounts, or rackmount using the included rackmount kit (GC510P, GC510PP only). Auto-join and Configure (Zero-Touch Provisioning) Additional Insight Managed devices added to the network automatically inherit settings and configuration. IPv4 & IPv6 Static Routing A simple way to provide segmentation of the network with internal routing through the switch – reserving the router for external traffic routing only, making the entire network more efficient. Auto-VoIP, Auto-Voice VLAN, and Auto-Video VLAN! Automatic Voice over IP prioritization (Auto-VoIP) simplifies most complex multi-vendor IP telephone deployments either based on protocols (SIP, H.323 and SCCP) or on OUI bytes (default database and user-based OUIs) in the phone source MAC address, providing the best class of service to VoIP streams (both data and signaling) over other ordinary traffic by classifying traffic, and enabling correct egress queue configuration. Similarly, Auto-Video VLAN enables IGMP snooping to minimize broadcast streams. PoE Timer and Scheduling (except GC110) Allows IT administrators to increase network security, better utilize network resources and conserve energy by scheduling or remotely controlling on/off of PoE ports. Firmware Updates from Cloud Direct cloud-to-device firmware updates, initiated and/or scheduled using the Insight app, all from the palm of your hand, anytime, anywhere! Download the NETGEAR Insight Managed Gigabit Ethernet Smart Cloud Switches Datasheet (PDF).